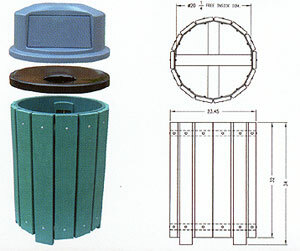 This grey plastic dome lid with spring-hinged door is a alternative to the funnel lid that can be fitted over the trash receptacle. This Funnel type steel lid, coated with black powder, is 16 gauge thickness and fits over trash receptacle. Our liners have a capacity of 32 US gallon (26 cdn gallon), is made of heavy duty polyethylene, and fits inside the trash receptacle. Trash receptacle can be anchored with this galvanized inground mounting footer with a 2 3/8’’ OD stell support pipe and a welded 6’’ X 6’’ X 3/16’’ steel mount plate. Trash receptacle can alternatively be fitted over this galvanized surface mounting footer with a 2 3/8’’ OD steel support pipe with two welded 6’’ X 6’’ X 3/16’’ steel mount plates. For more comfort, you can add this armrest to the Contour, Standard and Deco benches. * Our lumber can also be bought separately.